Help us shape the development of Super Animal Royale! Join our Discord server or sign up for our email list and help shape the game's development through Early Access. Super animal news and updates, right in your inbox! Purchase an Early Access Steam key and help influence Super Animal Royale's development as we work to complete it with your input! More than 100 cosmetics and 50 animal breeds to earn in Early Access. 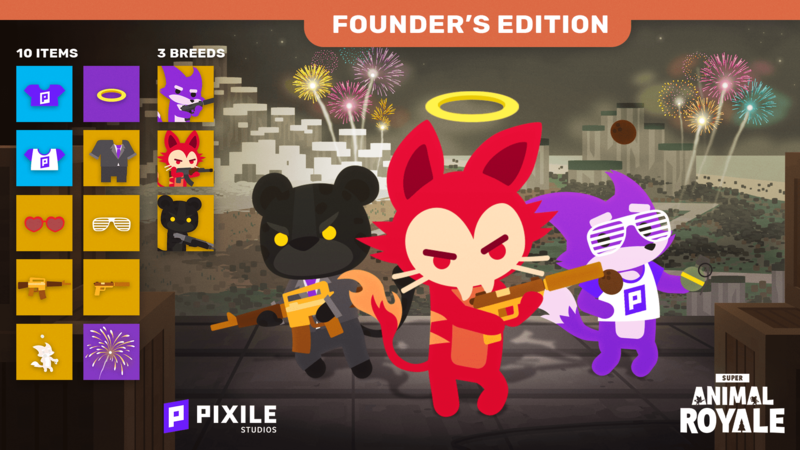 What's included in the Founder's Edition? Super Animal Royale is coming first to PC and Mac as part of Steam's Early Access program. Steam Early Access enables creators to provide games to gamers early to get valuable feedback during development, and empower gamers to influence the development of the games they love. As of Early Access launch, all the core gameplay mechanics in Super Animal Royale are implemented and a lot of balancing work has been done, but we’ll continue to take more feedback and refine everything throughout Early Access. There are already more than 100 cosmetic items and 50 Super Animal breeds. Solos, Duos and Squads are implemented and support both team text chat and all text chat. The island has multiple biomes including evergreen forest, deciduous forest, swamp, desert, and a snowy north. It also has some of its first story-related points of interest including the S.A.W. Research Labs, with more coming soon. There are 12 weapons (including your starting melee weapon) in the game with 5 different levels of rarity, and more are coming soon. How beefy does my computer need to be? View our minimum required specs on our Steam page. Minimum specs are still a moving target while the game is in active development pre-launch, but we're trying to optimize as much as we can to support older / lower end laptops and PCs. You can join a beta test if you'd like to see how the game performs on your computer before you pre-order! Does Super Animal Royale have a Season’s Pass? 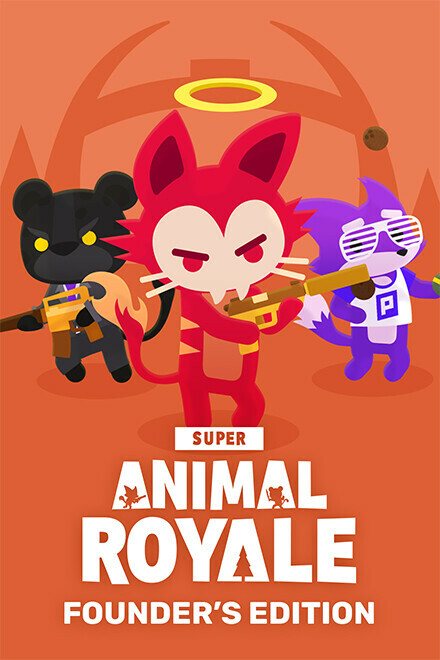 The Early Access version of Super Animal Royale launches initially without additional in-app-purchases (IAP) or Season’s Passes, aside from the skins included in the Founder’s Edition. We’re focusing first on providing a ton of value in the base game, so we’re including more than 100 cosmetic items and 50 animal breeds that players can unlock without any additional purchase. Future added cosmetics and IAP will be optional additions to this content that help support the creation of further game development. Cosmetics will not provide players with any gameplay advantage, but will be a whole lot of fun in the animal customizer :). In a previous version of the website, before Early Access launch, we listed “Super Animal Pass Season 0” as an item that would be included with the Early Access version of the game. All of the cosmetic items planned for Super Animal Pass Season 0 will still be included with the Early Access version of the game at launch on December 12th, but they will be unlocked by progressing through the game (dropping at the end of matches) rather than in a traditional season’s pass format. We’ll also be creating new free cosmetic content throughout Early Access beyond this initial free content pack. Future versions of Super Animal Royale might include a new season’s pass, but if we do add one we will create new cosmetic content for it at that time. 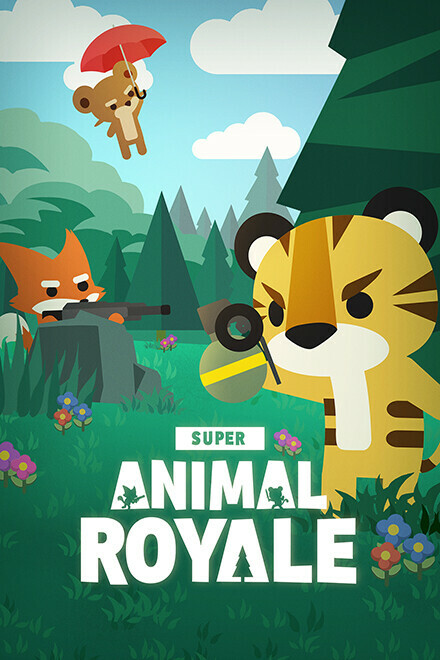 No, at this time, Super Animal Royale requires an Internet connection to play. If you'd like an offline mode feel free to provide feedback in our feedback form or in our Discord server on what you'd like to see in an offline mode. You found it! You can download it right here, and feel to reach out to us at contact@pixilestudios.com.